The founder of Christian Science was Mary Ann Morse Baker Glover Patterson Eddy, born in Bow, New Hampshire in 1821, to Mark and Abigail Baker. Her parents were members of the Congregationalist church which upheld a strict doctrine of predestination that unsettled young Mary. "The doctrine of unconditional election or predestination, greatly troubled me: for I was unwilling to be saved, if my brothers and sisters were to be numbered among those who were doomed to perpetual banishment from God" (Mary Baker Eddy, Retrospection and Introspection, 13:5‑9). Her life later became characterized by the rejection of doctrines that are central to the Christian faith. In 1866, while still married to Daniel Patterson, she discovered the principle of Christian Science after a serious fall allegedly brought her near death. Her account of the severity of the injuries was contradicted by the attending physician. Nevertheless, the principles "discovered" during this time were to be the basis of Christian Science. In 1875, her work Science and Health was published with the additional Key to the Scriptures added in 1883. For this work she claimed divine revelation. 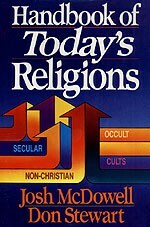 "I should blush to write of Science and Health with Key to the Scriptures as I have, were it of human origin and I apart from God its author, but as I was only a scribe echoing the harmonies of Heaven in divine metaphysics, I cannot be super‑modest of the Christian Science Textbook" (Christian Science Journal, Jan. 1901). In 1879 in Charlestown, Massachusetts, the Church of Christ Scientist was organized and was then changed in 1892 to the First Church of Christ Scientist. The Church Manual was published in 1895 establishing the procedures of governing the church. Although she taught that death is "an illusion, the life of life" (Science and Health, 584:9), Mrs. Eddy passed away December 3, 1910. Way there is a self‑perpetuating board of directors which governs the church. There is no way to get an accurate number of Christian Scientists today since the Church Manual says, "Christian Scientists shall not report for publication the number of the members of the Mother Church, nor that of the branch churches" (Article VIII, p. 48). Observers estimate worldwide membership at 420,000. Christian Science, like many other cults, claims further revelation that goes "beyond the Bible" ‑that is to say, new divine truth previously unrevealed. "But I certify you, brethren, that the Gospel which was preached of me is not after man. For I neither received it of man, neither was I taught it, but by the revelation of Jesus Christ." "In the year 1866, 1 discovered the Christ Science or divine laws of Life, Truth, and Love and named my discovery Christian Science. God has been graciously preparing me during many years for the reception of this final revelation of the absolute divine Principle of scientific mental healing" (Science and Health, 107:1‑6). She goes on, "Whence came to me this heavenly conviction ... When apparently near the confines of mortal existence, standing already within the shadow of the death‑valley, I learned these truths in divine Science" (Science and Health, 108:1, 19‑21). "I won my way to absolute conclusions through divine revelation, reason, and demonstration. The Revelation of Truth in the understanding came to me gradually and apparently through Divine Power" (Science and Health, 109:20‑23). Mrs. Eddy's claims are clear: The revelation she received while near death was divine. She also claims exclusive truth: "Is there more than one school of Christian Science? ... There can, therefore, be but one method in its teaching" (Science and Health, 112:3‑5). Needless to say the one method is her method. The Christian Science Church Manual states their purpose as "to commemorate the word and works of our master, which should reinstate primitive Christianity and its lost element of healing" (The Christian Science Church Manual, 89th ed., p. 17). The following paragraph reveals Mrs. Eddy's monumental claims. "Late in the nineteenth century I demonstrated the divine rules of Christian Science. They were submitted to the broadest practical test, and everywhere, when honestly applied under circumstances where demonstration was humanly possible, this science showed that truth had lost none of its divine and healing efficacy, even though centuries had passed away since Jesus practiced these rules on the hills of Judaea and in the valleys of Galilee" (Science and Health, 147:6‑13). Therefore, Christian Science claims to have restored the lost element in Christianity, namely healing, that when applied, demonstrates itself to work. Moreover, this knowledge of divine healing claims to have been revealed to Mrs. Eddy who is sharing this "exclusive truth" with the world. Thus, Christian Science claims to go further than the orthodox churches by reinstating that which was missing. Mrs. Eddy claimed that she derived her teachings from the Bible, which she considered her final authority. However, in practice, and as we have just seen above, she also claimed that her revelations were better and "higher" than the Bible. Where the Bible contradicted her beliefs, she felt free to dismiss its authority. "The Bible has been my only authority. I have no other guide in 'The straight and narrow way' of Ruth" (Science and Health, 126:29‑31). Although she claimed that the Bible was her guide, her view of Scripture was something less than desirable: "The material record of the Bible,. . is no more important to our well‑being than the history of Europe and America" (Mary Baker Eddy, Miscellaneous Writings, 1833‑1896, p. 170:19‑21). "The decisions by vote of Church Councils as to what should and should not be considered Holy Writ; the manifest mistakes in the ancient versions; the thirty thousand different readings in the Old Testament, and the three hundred thousand in the New,‑‑these facts show how a mortal and material sense stole into the divine record, with its own hue darkening to some extent the inspired pages" (Science and Health, 139:15‑22). In actuality, she does not obtain her teachings from the Bible even though the claim is made that "as adherents of Truth, we take the inspired Word of the Bible as our sufficient guide to eternal life" (Science and Health, 497: 3‑4). The fact is, the teachings of Christian Science are in direct contradiction to the Bible. The real authority in Christian Science is not the Bible, but the writings of Mrs. Eddy. "�.It is the voice of Truth to this age" (Science and Health, 456:27, 28). "�. The revealed Truth uncontaminated by human hypothesis" (Science and Health, 457:1‑2). "No human pen nor tongue taught me the Science contained in this book, SCIENCE AND HEALTH; and neither tongue nor pen can overthrow it" (Science and Health, 110: 16‑19). Christian Science does what so many of the cults do; it has a second authority which supersedes the Bible as the final authority in solving doctrinal matters. The writings of Mrs. Eddy constitute the final word as far as Christian Scientists are concerned, with the Bible relegated to a secondary status, although she paid lip service homage to the Bible. In a sermon delivered in June of 1890, Mrs. Eddy again made the claim to divine revelation: "Christian Science is irrevocable ‑ unpierced by bold conjecture's sharp point, by bald philosophy, or by man's inventions. It is divinely true, and every hour in time and in eternity will witness more steadfastly to its practical truth" (Mary Baker Eddy, Seven Messages to the Mother Church, pp. 20‑21). There is strong evidence to the contrary; that Mrs. Eddy's "divine revelation" is not original to her, but is a plagiarism of Phineas Quimby's writings and ideas. Phineas Quimby was a self‑professed healer who applied hypnosis and the power of suggestion in affecting his cures. He called his word, "The science of the Christ" and "Christian Science." Mrs. Eddy became an enthusiastic follower of Quimby in 1862 after her back injury was healed by him. She wrote letters to the Portland (Maine) Evening Courier praising Quimby and comparing him to Jesus Christ. Upon his death she eulogized Quimby in a poem, titling it, "Lines on the Death of Dr. P. R Quimby, who healed with the truth that Christ taught in contradistinction to all Isms." Eventually she attempted to separate any connection between herself and Quimby when charges of borrowing his ideas surfaced. However, the facts are otherwise. In 1921, Horatio Dresser published The Quimby Manuscripts, which when compared with Mrs. Eddy's writings, revealed many parallels leading some to comment, ". . . as far as thought is concerned, Science and Health is practically all Quimby" (Ernest Sutherland Bates and John V. Dittermore, Mary Baker Eddy: The Truth and The Tradition, 1932, p. 156). (For a thorough documentation of the Borrowing of Quimby's ideas we recommend Georgine Milmine, 1971, The Life of Mary Baker G. Eddy, Grand Rapids: Baker Book House reprint of a 1909 work, pp. 56‑104). Mrs. Eddy received the principles of Christian Science from some place other than the God of the Bible. Since her teachings contradict the teachings of God as revealed in the Bible, they are thereby condemned by the Bible and she is therefore a false teacher. Even though Christian Science claims to be a restatement of primitive, pure Christianity, it denies everything that is considered sacred to God's Word. Mrs. Eddy defined God as, "The great I Arn; the all‑knowing, all‑seeing, all acting, all‑wise, all‑loving, and eternal; Principle; Mind; Soul: Spirit; Life; Truth; Love; all Substance; Intelligence (Science and Health, 587:5‑8). Elsewhere she calls God "Divine Principle, Life, Truth, Love, Soul, Spirit, Mind" (ibid., 115:13‑14). At this period of enlightenment, a declaration from the pulpit that Christian Science is Pantheism is anomalous to those who know whereof they speak who know that Christian Science is science, and therefore, is neither hypothetical nor dogmatical, but demonstrable, and looms above the mists of Pantheism higher than Ararat above the deluge (Seven Messages to the Mother Church, Mary Baker Eddy, 1907, p. 10). The God who made the world and all things in it, since He is Lord of heaven and earth, does not dwell in temples made with hands; neither is He served by human hands, as though He needed anything, since He Himself gives to all life and breath and all things... (Acts 17:24, 25). The Christian Science view of the person of Christ is wholly unbiblical: "Christ is the ideal truth that comes to heal sickness and sin through Christian Science, and attributes all power to God. Jesus is the name of the man who, more than all other men, has presented Christ, the true idea of God ... Jesus is the human man, and Christ is the divine idea; hence the duality of Jesus the Christ" (Science and Health, 473:9‑16). Mrs. Eddy attempts to make a distinction between "Jesus" and "the Christ" as if they were two separate entities. This distinction is not possible for Jesus Christ is one person. Jesus is His name meaning "Yahweh is Salvation," Christ, His title, meaning "The Anointed One." The attempted distinction that Christian Scientists make between the two shows a complete lack of understanding of the Scriptures, such as Luke 2:11, 1 John 2:22, and I John 5:1. Since Jesus and Christ are two different entities in Christian Science, the doctrine that Jesus Christ is God is rejected, ". . . the Christian believes that Christ is God ... Jesus Christ is not God. . ." (Science and Health, 361:1, 2, 12). In direct contradiction to the above statement, the Bible clearly teaches the doctrine of the Holy Trinity. We do not believe in polytheism, or more than one God. We believe that in the nature of the one true God (Isaiah 43:10), there exists three eternal and distinct persons (Luke 3:22): the Father (2 Peter 1:17); the Word or Son (John 1:1, 14); and the Holy Spirit (Acts 5:3, 4). These three persons are the one God (Matthew 28:19). Concerning salvation, Mrs. Eddy said: "Life, Truth, and Love understood and demonstrated as supreme over all; sin, sickness and death destroyed" (Science and Health, p. 593:20‑22). Since to the Christian Scientist there is no such thing as sin, salvation in the biblical sense is totally unnecessary. The teachings concerning salvation in Mrs. Eddy's writings are both ambiguous and inconsistent. She stated over and over again that sin is just an illusion (Miscellaneous Writings, 27:11‑12, Science and Health, 71:2, 287:22, 23, 480:23, 24, etc.). On the other hand, she states as quoted above, that salvation is sin, sickness and death destroyed." If sin is only an illusion, having no real existence, how can it be destroyed? Putting it another way, do you destroy something that does not exist? Since there is no harmonious teaching in Christian Science concerning salvation, it is difficult to evaluate it objectively. Nevertheless, the Christian Science view is a far cry from the Bible that teaches the reality of sin (Romans 3:23) and the need for a Savior (Acts 4:12). In Christian Science there exists no evil: "Here also is found the path of the basal statement, the cardinal point in Christian Science, that matter and evil (including all inharmony, sin, disease, death) are unreal" (Miscellaneous Writings, 27:9‑12). According to Christian Science, "Christ came to destroy the belief of sin!' (Science and Health, 473:6, 7). It is fur�ther emphasized " . evil is but an illusion, and it has no real basis. Evil is a false belief, God is not its author" (Science and Health, 480:23, 24). The material blood of Jesus was no more efficacious to cleanse from sin when it was shed upon "the accursed tree" than when it was flowing in his veins as he went daily about his Father's business (Science and Health, 25:6‑8). In distinction, the Bible teaches that evil is real (1 John 5:19) and that we would be without salvation if Jesus Christ had not died on the cross for our sins (Hebrews 9:22). As Christians we can rejoice in the good news that Jesus Christ "gave himself for our sins, that He might deliver us out of this present evil age, according to the will of our God and Father, to whom be the glory forevermore. Amen" (Galatians 1:4, 5). "Our Master ... practiced Christian healing ... but left no definite rule for demonstrating this Principle of healing and preventing disease. This rule remained to be discovered by Christian Science" (Science and Health, 147:24‑29). "Thousands of letters could be presented in testimony of the healing efficacy of Christian Science and particularly concerning the vast number of people who have been reformed and healed through the perusal or study of this book" (Science and Health, p. 600). Followed by this claim are approximately 100 pages of testimonials of healing of every conceivable disease by those who have embraced the principles of Christian Science. The obvious question arises: Can Christian Science heal? While many of the healings in Christian Science can be explained without appealing to the miraculous, there are some accounts of seemingly true healings. If this be the case, then it would be an example of the "signs and false wonders" the Apostle Paul spoke about (2 Thessalonians 2:9). Satan is the great counterfeiter and his attempt to duplicate the works of God and the miracle of healing is no exception. We all want to be healthy, but not at the cost of abandoning Christ. Christian Science is neither Christian nor scientific because every important doctrine of historic Christianity is rejected by Christian Science. The claim of divine revelation by Mrs. Eddy is contradicted by the facts that clearly attest she does not represent the God of the Bible. Although she speaks in the name of Jesus, her teachings conflict with His in every respect. Fortunately, Jesus warned us ahead of time about people like Mrs. Eddy: "Beware of the false prophets, who come to you in sheep's clothing, but inwardly are ravenous wolves. You will know them by their fruits" (Matthew 7:15, 16 NASB). Animal Magnetism ‑According to Christian Science, animal magnetism, which is wrong thinking, causes an individual to experience the illusion of evil. Malicious animal magnetism can kill those it is practiced against. At‑one‑ment‑ In Christian Science and other gnostic cults, it is the unity between the mind of God and the mind of man as demonstrated by Christ. Christian Science Journal‑ Periodical of Christian Science, used for recruitment of new members. Christian Science Monitor‑ Newspaper published by Christian Science, highly regarded in the secular world, with little religious propaganda. Christian Science Sentinel ‑Periodical of Christian Science, used for recruitment of new members. Eddy, Mary Baker‑ Founder of Christian Science. Mrs. Eddy (her third married name) said she discovered Christian Science as a result of a miraculous healing she supposedly received after a fall. She authored the text Science and Health with Key to the Scriptures that Christian Scientists revere above the Bible. Mortal Mind‑According to Christian Science, it is the source of the illusions of evil, sickness, sin and death. Quimby, P.P. ‑Early 19th century mesmerist and psychic healer from whom Mary Baker Eddy learned the principles she later claimed were revealed from God as Christian Science. Science and Health with Key to the Scriptures ‑ Contains the teachings of Mary Baker Eddy, the founder of Christian Science. The book is regarded as a revelation with more authority than the Bible.